Émile Durkheim (15 April, 1858 – 15 November, 1917) was a French sociologist and anthropologist who was decisive in shaping modern sociology. His work, lectures, and editorship of the first journal of sociology helped establish it within the academy as an accepted "science sociale" (social science). 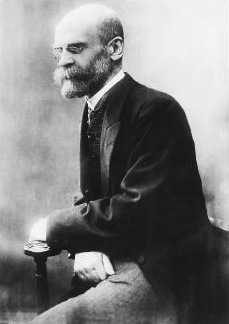 During his lifetime, Durkheim gave many lectures, and published numerous sociological studies on subjects such as education, crime, religion, suicide, and many other aspects of society. Durkheim was born on the evening of April 15, 1858 at Épinal in Lorraine in France. He came from a long line of devout French Jews; his father, grandfather, and great-grandfather had been rabbis. Durkheim himself lived a completely secular life. Much of his work, in fact, was dedicated to demonstrating that religious phenomena stemmed from social rather than divine factors. His Jewish background did, however, shape his sociology — many of his students and collaborators were fellow Jews, and often blood relatives. A precocious student, Durkheim entered the École Normale Supérieure in 1879. His entering class was one of the most brilliant of the nineteenth century and many of his classmates, such as Jean Jaurès and Henri Bergson would go on to become major figures in France's intellectual life. At the ENS Durkheim studied with Fustel de Coulanges, a classicist with a social scientific outlook. At the same time, he read Auguste Comte and Herbert Spencer. Thus Durkheim became interested in a scientific approach to society very early on in his career. This meant the first of many conflicts with the French academic system, which had no social science curriculum at the time. Durkheim found humanistic studies uninteresting, and he finished second to last in his graduating class when he aggregated in philosophy in 1882. Durkheim's interest in social phenomena was also spurred on by politics. France's defeat in the Franco-Prussian War had created a backlash against secular, republican rule and many considered a Catholic, vigorously nationalistic approach the only way to rejuvenate France's fading power on the continent. Durkheim, a Jew and socialist, was thus in the political minority, a situation which galvanized him politically. The Dreyfus affair of 1894 only strengthened his activist stance. There was no way that a man of Durkheim's views could receive a major academic appointment in Paris, and so after spending a year studying sociology in Germany he traveled to Bordeaux in 1887, which had just started France's first teacher's training center. There he taught both pedagogy and social science (a novel position in France). From this position Durkheim reformed the French school system and introduced the study of social science in its curriculum. However, his controversial beliefs that religion and morality could be explained in terms purely of social interaction earned him many critics. The 1890s were a period of remarkable creative output for Durkheim. In 1893 he published The Division of Labor in Society, his fundamental statement of the nature of human society and its development. In 1895 he published Rules of the Sociological Method, a manifesto stating what sociology was and how it ought to be done, and founded the first European Department of Sociology at the University of Bordeaux. In 1896 he founded the journal L'Année Sociologique in order to publish and publicize the work of what was by then a growing number of students and collaborators (this is also the name used to refer to the group of students who developed his sociological program). And finally, in 1897, he published Suicide, a case study which provided an example of what the sociological monograph might look like. In 1902 Durkheim finally achieved his goal of attaining a prominent position in Paris when he became the chair of education at the Sorbonne. Because French universities are technically institutions for training secondary school teachers, this position gave Durkheim considerable influence - his lectures were the only ones that were mandatory for the entire student body. Despite what some considered, in the aftermath of the Dreyfus affair, to be a political appointment, Durkheim consolidated his institutional power by 1912 when he was permanently assigned the chair and renamed it the chair of education and sociology. It was also in this year that he published his last major work, Elementary Forms of the Religious Life. World War I was to have a tragic effect on Durkheim's life. Durkheim's leftism was always patriotic rather than internationalist — he sought a secular, rational form of French life. But the coming of the war and the inevitable nationalist propaganda that followed made it difficult to sustain this already nuanced position. While Durkheim actively worked to support his country in the war, his reluctance to give in to simplistic nationalist fervor (combined with his Jewish background) made him a natural target of the now-ascendant French right. Even more seriously, the generation of students that Durkheim had trained were now being drafted to serve in the army, and many of them perished as France was bled white in the trenches. Finally, Durkheim's own son died in the war — a mental blow from which Durkheim never recovered. Emotionally devastated and overworked, Durkheim collapsed of a stroke in Paris in 1917. Durkheim was concerned primarily with how societies could maintain their integrity and coherence in the modern era, when things such as shared religious and ethnic background could no longer be assumed. In order to study social life in modern societies, Durkheim sought to create one of the first scientific approaches to social phenomena. Along with Herbert Spencer, Durkheim was one of the first people to explain the existence and quality of different parts of a society by reference to what function they served in keeping the society healthy and balanced—a position that would come to be known as functionalism. Durkheim also insisted that society was more than the sum of its parts. Thus unlike his contemporaries Ferdinand Tönnies and Max Weber, he focused not on what motivates the actions of individual people (methodological individualism), but rather on the study of social facts, a term which he coined to describe phenomena which have an existence in and of themselves and are not bound to the actions of individuals. He argued that social facts had an independent existence greater and more objective than the actions of the individuals that composed society and could only be explained by other social facts rather than, say, by society's adaptation to a particular climate or ecological niche. In his 1893 work The Division of Labor in Society, Durkheim examined how social order was maintained in different types of societies. He focused on the division of labor, and examined how it differed in traditional societies and modern societies. Authors before him such as Herbert Spencer or Otto von Gierke had argued that societies evolved much like living organisms, moving from a simple state to a more complex one resembling the workings of complex machines. Durkheim reversed this formula, adding his theory to the growing pool of theories of social progress, social evolutionism and social darwinism. He argued that traditional societies were 'mechanical' and were held together by the fact that everyone was more or less the same, and hence had things in common. In traditional societies, argues Durkheim, the collective consciousness entirely subsumes individual consciousness—social norms are strong and social behavior is well-regulated. In modern societies, he argued, the highly complex division of labor resulted in 'organic' solidarity. Different specializations in employment and social roles created dependencies that tied people to one another, since people no longer could count on filling all of their needs by themselves. In 'mechanical' societies, for example, subsistence farmers live in communities which are self-sufficient and knit together by a common heritage and common job. In modern 'organic' societies, workers earn money, and must rely on other people who specialize in certain products (groceries, clothing, etc.) to meet their needs. The result of increasing division of labor, according to Durkheim, is that individual consciousness emerges distinct from collective consciousness—often finding itself in conflict with collective consciousness. Durkheim also made an association of the kind of solidarity in a given society and the preponderance of a law system. He found that in societies with mechanical solidarity the law is generally repressive: the agent of a crime or deviant behaviour would suffer a punishment, that in fact would compensate collective conscience neglected by the crime—the punishment acts more to preserve the unity of consciences. On the other hand, in societies with organic solidarity the law is generally restitutive: it aims not to punish, but instead to restitute normal activity of a complex society. The rapid change in society due to increasing division of labor thus produces a state of confusion with regard to norms and increasing impersonality in social life, leading eventually to relative normlessness, i.e. the breakdown of social norms regulating behavior; Durkheim labels this state anomie. From a state of anomie come all forms of deviant behavior, most notably suicide. Durkheim developed the concept of anomie later in Suicide, published in 1897. In it, he explores the differing suicide rates among Protestants and Catholics, explaining that stronger social control among Catholics results in lower suicide rates. According to Durkheim, people have a certain level of attachment to their groups, which he calls social integration. Abnormally high or low levels of social integration may result in increased suicide rates; low levels have this effect because low social integration results in disorganized society, causing people to turn to suicide as a last resort, while high levels cause people to kill themselves to avoid becoming burdens on society. According to Durkheim, Catholic society has normal levels of integration while Protestant society has low levels. This work has influenced proponents of control theory, and is often mentioned as a classic sociological study. Finally, Durkheim is remembered for his work on 'primitive' (i.e. non-Western) people in books such as his 1912 volume Elementary Forms of the Religious Life and the essay Primitive Classification that he wrote with Marcel Mauss. These works examine the role that religion and mythology have in shaping the worldview and personality of people in extremely (to use Durkheim's phrase) 'mechanical' societies. In Elementary Forms of the Religious Life Durkheim develops a theory of religion which is based on Collective Effervescence. Durkheim was also very interested in education. Partially this was because he was professionally employed to train teachers, and he used his ability to shape curriculum to further his own goals of having sociology taught as widely as possible. More broadly, though, Durkheim was interested in the way that education could be used to provide French citizens the sort of shared, secular background that would be a necessary to prevent anomie in modern societies. It was to this end that he also proposed the formation of professional groups to serve as a source of solidarity for adults. History: Learning about individuals who have done good things for the many makes an individual feel insignificant. Pledging allegiance: Makes individuals feel part of a group and therefore less likely to break rules. School is a society in miniature. It has a similar hierarchy, rules, expectations to the "outside world". It trains young people to fulfill roles. To maintain division of labour. School sorts students into skill groups, encouraging students to take up employment in fields best suited to their abilities. Durkheim's views on crime were a departure from conventional notions. He believed that crime is "bound up with the fundamental conditions of all social life" and serves a social function. He stated that crime implies, "not only that the way remains open to necessary change, but that in certain cases it directly proposes these changes...crime [can thus be] a useful prelude to reforms." In this sense he saw crime as being able to release certain social tensions and so have a cleansing or purging effect in society. He further stated that "the authority which the moral conscience enjoys must not be excessive; otherwise, no-one would dare to criticise it, and it would too easily congeal into an immutable form. To make progress, individual originality must be able to express itself...[even] the originality of the criminal...shall also be possible" (Durkheim, 1895). How did religion contribute to the maintenance of social order? What was the relationship between religion and capitalist society? These two issues were typically combined in the argument that industrial capitalism would undermine traditional religious commitment and thereby threaten the cohesion of society. More recently the subject has been narrowly defined as the study of religious institutions. Emile Durkheim placed himself in the positivist tradition, meaning that he thought of his study of society as dispassionate and scientific. He was deeply interested in the problem of what held complex modern societies together. Religion, he argued, was an expression of social cohesion. His underlying interest was to understand the basic forms of religious life for all societies. Durkheim, saw totemism as the original form of religion. The totemic animal, Durkheim believed, was the original focus of religious activity because it was the emblem for a social group, the clan. He thought that the function of religion was to make people willing to put the interests of society ahead of their own desires. One of the major functions of religion according to Durkheim was to prepare people for social life. Durkheim thought that the model for relationships between people and the supernatural was the relationship between individuals and the community. He is famous for suggesting that "God is society, writ large." Durkheim believed that people ordered the physical world, the supernatural world, and the social world according to similar principles. Durkheim’s first purpose was to identify the social origin of religion as he felt that religion was a source of camaraderie and solidarity. It was the individual’s way of becoming recognisable within an established society. His second purpose was to identify links between certain religions in different cultures, finding a common denominator. Belief in supernatural realms and occurrences may not stem through all religions, yet there is a clear division in different aspects of life, certain behaviours and physical things. He suggested there were two categories: the sacred and the profane. In the past, he argued, religion had been the cement of society--the means by which men had been led to turn from the everyday concerns in which they were variously enmeshed to a common devotion to sacred things. He said "A religion is a unified system of beliefs…relative to sacred things…beliefs and practices which unite in one single moral community called a Church, all those who adhere to them." Durkheim believed that “society has to be present within the individual”, he saw religion as a mechanism that shored up or protected at threatened social order. He thought that religion had been the cement of society in the past, but that the collapse of religion would not lead to a moral implosion. Durkheim was specifically interested in religion as a communal experience rather than an individual one. He also says that religious phenomena occurs when a separation is made between the profane (the realm of everyday activities), and the sacred (the realm of the extraordinary and the transcendent); theses are different depending what man chooses it to be. An example of this is wine at communion, as it is not only wine but it represents the blood of Christ. Durkheim believes that religion is ‘society divinised’, as he argues that religion occurs in a social context. He also, in lieu of forefathers before who tried to replace the dying religions, urged people to unite in a civic morality on the basis that we are what we are as a result of society. Steven Lukes, Emile Durkheim: His Life and Work, a Historical and Critical Study. Stanford University Press, 1985.